When I was a kid, I always thought we were just a couple years away from being able to grab a jetpack, strap it on to our backs and fly to wherever we wanted in the blink of an eye. I thought flying would be an amazing feeling and something I couldn’t wait to try. 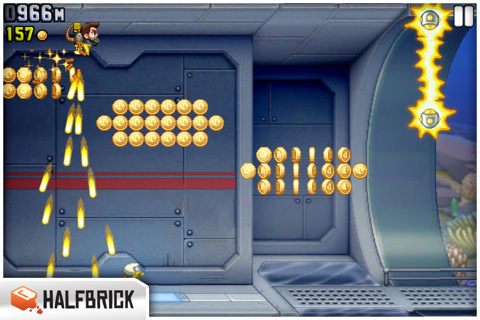 Jetpack Joyride, a new universal app from Halfbrick Studios, finally gave me the chance to see what life with a jetpack would be like, and frankly, it’s a lot more dangerous (and a whole lot more fun) than I ever imagined as a kid. 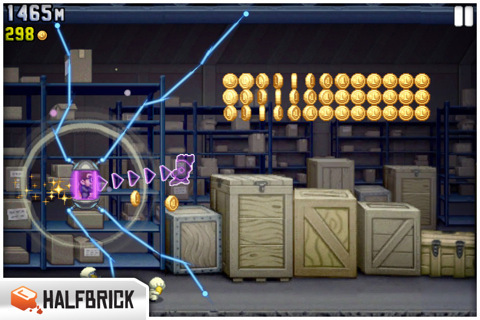 Jetpack Joyride allows you to take control of Halfbrick’s own Barry Steakfries (star of one of Halfbrick’s other hits, Monster Dash) as he steals a jetpack belonging to scientists and tries to make his escape from the secret laboratory. Of course, you can’t escape, you just try to get as far as you can before you die. That’s the fun of Jetpack Joyride. There isn’t any winning, there’s just playing. And let me tell you, the playing is a blast! There is one control to Jetpack Joyride: tap the screen to fly. If you let go of the screen, gravity will take over and you will begin to fall back to earth. All of this sounds simple enough, but things become more complicated when you take into account the lasers, zappers, and missiles you must avoid. One touch spells certain death for Barry, so fly with caution. As you fly across the laboratory, you’ll have to navigate your vertical position to avoid being zapped or exploded to your doom. Of course, as your speed increases you have less time to react to the oncoming obstacles and waiting for gravity to take its effect can be painful at times when you need to fall and fall quickly. However, the control of Barry feels absolutely perfect, you rise when you tap, you fall when you let go, and once you’re used to feathering the controls you’ll be dipping and dodging with expert precision. While it may seem that there isn’t very much depth to the game, that couldn’t be further from the truth. Halfbrick gives you three missions at all times to complete, and completing the missions gives you stars which allows you to “level up”. These missions range from collecting a set number of coins to dying a certain distance into your run. Since the game replaces a completed mission with a new one, you always have a new set of challenges to complete. Couple the missions with the ability to “drive” really cool vehicles along the way like the “Crazy Freaking Teleporter” and the “Lil Stomper” and you have a game that will have you playing again and again on your iPhone or iPad. Jetpack Joyride goes beyond addicting, it needs another word to describe it (Addictacular? Addictastic?). With a beautifully simple design and snappy controls, Jetpack Joyride is definitely a game to add to your home screen. Ths universal game is now available in the App Store for $0.99. AppSafari review of Jetpack Joyride was written by Alex Seiver on September 3rd, 2011 and categorized under App Store, Arcade, Games, Platformer. Page viewed 5991 times, 1 so far today. Need help on using these apps? Please read the Help Page.